You don’t need the perfect planner. You need the right habits. With the right patterns & practices in place, your plan can help you even when – especially when – life doesn’t go according to that plan. Too often, we make plans and then never look at them. Too often, we set unrealistic expectations and kick ourselves when they fall apart. Absolutely. It is written from a Christian perspective, but explicit references come out only in the introduction, the conclusion, and the module on vocation. This course is primarily practical rather than foundational. The Premium membership does include an extra module on working your homeschool plan, with information about the big picture, the yearly view, the term, the week, and the day. The homeschool module shows you how to put your plan into action consistently and troubleshoot obstacles. 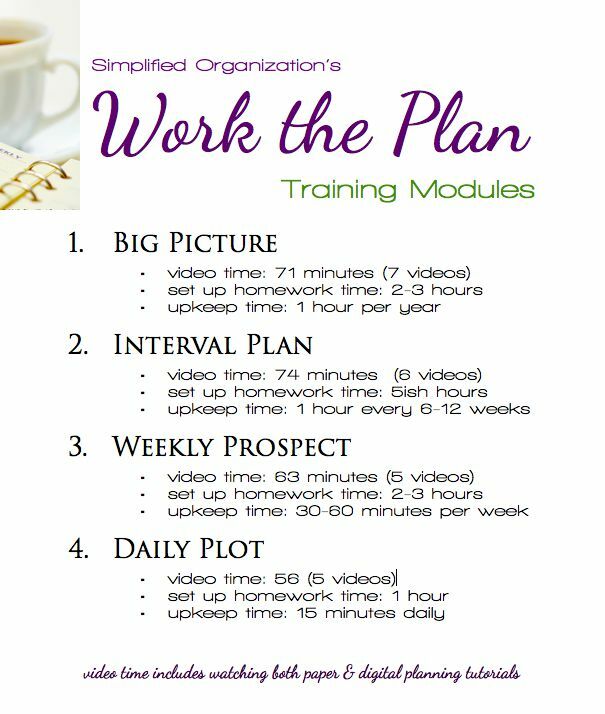 Work the Plan is a self-paced course, so you can power through it or take your time. You can have practical changes to make for tomorrow within an hour if you jump right in.With four modules, applying all the steps will take a minimum of one week, but most members take one or two weeks per module. Some people work through the whole course quickly the first time around to get a sense of the whole, then return to the beginning and slowly incorporate each piece into their rhythms.The member forums are a great place to get accountability as you work through the material, no matter how fast or how slow you choose to go. Membership never expires. Once my system is up and running, how much time does it take to maintain? The habits that you will learn in this course require fifteen minutes a day (except Sundays), plus one hour a week, plus 1 hour every 6-8 weeks, plus 1 hour every year. On average, then, these habits take about 2 1/2 hours a week to maintain - 2 1/2 hours invested into making the other 93 1/2 weekly waking, productive hours (excluding a complete weekly day of rest) clear, focused, and fruitful. Sometimes my planning feels like a waste of time. How will this help? Too much of our planning energies are spent creating a plan rather than working a proven system. If we invest our time and effort into building effective habits rather than creating new routines, we'll start gaining momentum, seeing where and how to invest our energy where it counts - doing, rather than planning, choosing the right next thing instead of the easy next thing.It takes practice and it takes an ordered procedure. You could spent time figuring out your own procedure from scratch or you can benefit from my research and trial and error and jump straight to a principle-based method that works. I've never done an online course. Can I do this if I'm not technology-savvy? Yes! If you can browse a blog, you can take this course. The material is not on some fancy learning software, but set up like a blog, except with super-clear navigation - navigation you can mark as complete as you move through so you never lose your place. It's not complicated, and you can always contact me directly by email or in the forum if you encounter difficulties. How is Work the Plan different from Simplified Organization: Learning to Love What Must Be Done? Work the Plan is all about making your plan practical, realistic, and applicable. It assumes you know what you should be doing; Simplified Organization: Learning to Love What Must Be Done walks you through figuring that out from scratch. If you know you could be more effective and are unsatisfied with your level of productivity, Work the Plan will show you how to get the traction you need.Simplified Organization: Learning to Love What Must Be Done is a deep and thorough course all about fixing things from the inside out. It's encouraging and basic. It's written for women who are discouraged in their homemaking, feel like they barely keep their heads above water, and don't even know where to start.They do work together, and Work the Plan would be a good final module to go through after Simplified Organization: Learning to Love What Must Be Done.In fact, you can buy both together for a bundle package here. I don't have kids at home. Does this course still apply to me? Whether your kids are grown and gone or you don't have kids, this system will still work for you. Some of my examples will be geared toward those managing a busy, large family, but the practices are built on principles that transcend family size or season. I've tried new systems and planners before and they didn't work. How is yours different? You can't simply take someone else's setup, fill it with your life's details, and expect it to work without a hitch. Instead of transferring someone else's plan to your life, you need to learn the principles so you can flex and adapt to manage your own situations and circumstances.If someone else's plan hasn't worked for you, the problem is not with you. It's with the plan. Work the Plan will show you how to build the planning processes and practices that will work because you're applying principles and habits rather than complete systems or someone else's plans. My biggest problem is consistency. What if I can't even do your program consistently? Your problem with consistency might be a problem with the plans you've tried in the past rather than with you. If the plan you tried was designed by a different personality type, it might only work for that type and not yours. The principles and practices taught in Work the Plan transcend personalities and situations; they can be fitted to you - you don't have to change to fit them.Also, if working through the material is too much of a burden and you can't make use of it, you can request a full refund within 30 days. All requests for refunds within 30 days will be honored, no questions asked. What if my problem is my own laziness? Then no one else's list will cure that. The best way to overcome habits of laziness is to slowly and steadily build habits of proper planning and executing, which is what Work the Plan is all about. You won't - and can't - experience overnight change, but you can know for sure that you have found the path forward to gradually exchanging poor habits for productive habits.However, most of the women who call themselves lazy are actually prisoners of their own false expectations. Work the Plan also addresses our expectations and teaches how to manage them and keep them lined up with our present reality. I think I'd rather just buy a new planner. Programs don't work, anyway. Planners don't work without the right habits in place to make them useful. Unless you use the planner, it won't work for you. 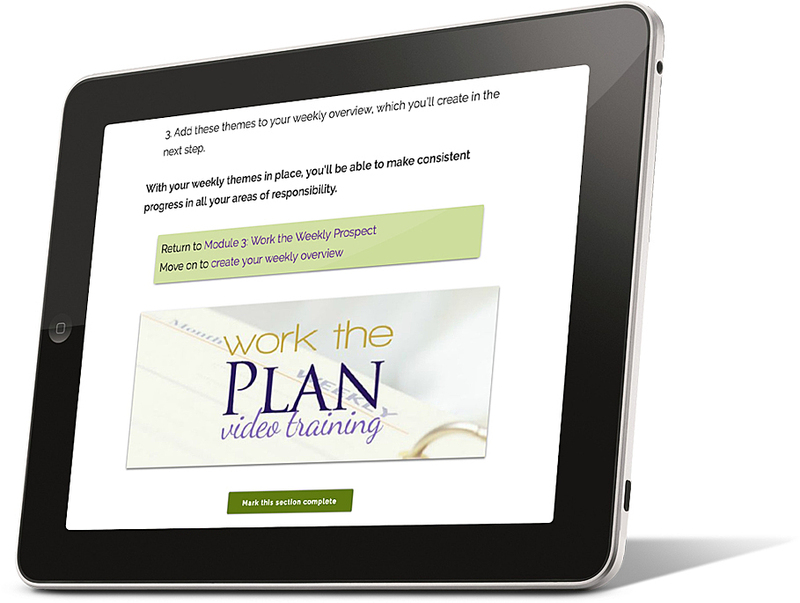 Work the Plan will teach you how to kick your planning into high gear by making it super applicable in your life. Making a new plan won't get you anywhere. Working your plan will take you far. I have a 30-day money-back guarantee, so if you start into the course and it doesn't resonate with you or you find out it wasn't what you were expecting or wasn't what you needed, I'll refund your purchase within 24 hours. Just ask. There is no payment plan option. However, if you start with the basic plan you can upgrade at any time to the premium version for the difference. The upgrade option is in the course sidebar.